Olympic Nat’l Park: day 1! A change of plans can be a good thing. Getting to and around Olympic was going to be the most challenging part of my adventure. Once all my options had been weighed, I ended up renting a car (which I had been trying to avoid). That one small decision opened up more of the park to my short trip out here. Instead of backpacking in a small section, I am going to car camp and see much more of the park. With the cloud cover, I think I will head out to the rain forest tomorrow and camp there in the evening. But let’s back up a bit. Other than the 1.5 hours of turbulence while crossing the Rockies, my flight out to SeaTac was uneventful. America is super huge! I arrived at 10:30 local time, or 1:30am eastern time. Zach Lyman picked me up and whisked me off to their home in Tacoma. Anne was up to greet me and help with some logistical details. Zach and I enjoyed a beer, then I hit the sack pretty hard. Friday morning I slept in until about 8am. Anne had made some tasty coffee so the day was off to a great start! Milo was up and finally learned I was their house guest. He was super excited. We played sone football in the play room. He has quite an arm! Afterwards we went out for breakfast, stopping first at Satellite Coffee of lattes and a macchiato for me. It was a teeny place perched on the roof if another building. Then we went to Hob Nob…I had biscuits and gravy and eggs for breakfast! With breakfast sitting like a tasty brick in my stomach, Zach and I headed off to REI to pick up some more supplies. I needed fuel for my stove (thanks TSA) and also some more food, now that I was adding more time in the park to my itinerary. Now things sped up…back to the house to fuel and test the stove, pack, fill my hydration bladder, then Anne and I were off to the airport again! By 3:30 I was in my rental car and slogging through traffic, on my way yo the park. By 6:30 I had finally arrived at Heart o’ the Hills campground, just inside the fee station outside Port Angeles. 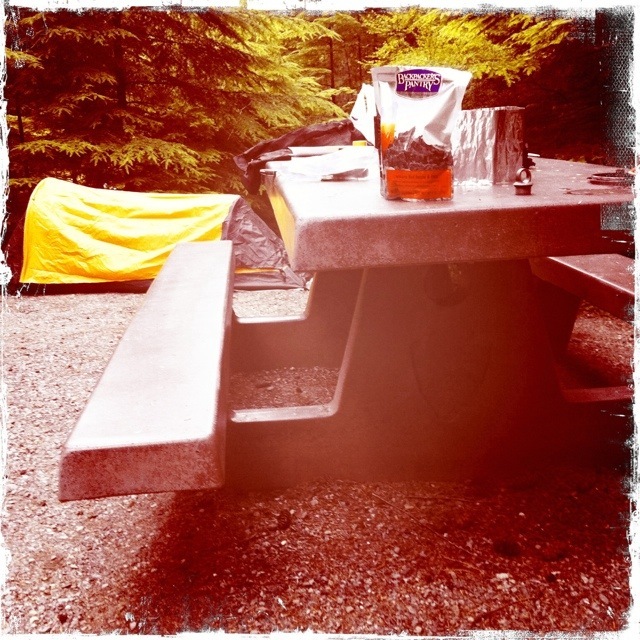 I go one of the few remaining camp sites right across from the bathroom…it was like camping in the middle of the city! I set up my tent, had dinner, and tried to have a camp fire. This I was definitely unprepared for…without proper kindling I couldn’t get the fire to keep going, though there were several close starts. After about 20 minutes I gave up and read for a bit, then to bed.